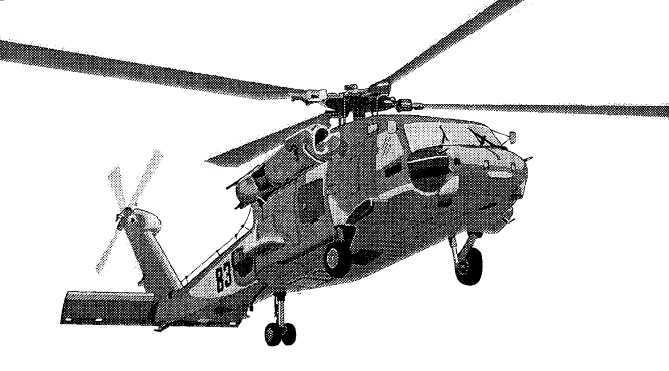 A typical Navy helicopter, the H-60, is shown in figure 4-17. Some of its features include a single main rotor, twin engine, tractor-type canted tail rotor, controllable stabilizer, fixed landing gear, rescue hoist, external cargo hook, and weapons pylons. The fuselage consists of the entire airframe, sometimes known as the body group. The body group is an all-metal semimonocoque construction. It consists of an aluminum and titanium skin over a reinforced aluminum frame. LANDING GEAR GROUP The landing gear group includes all the equipment necessary to support the helicopter when it is not in flight. There are several types of landing gear on helicoptersconventional fixed (skid type), retractable, and nonretractable. Main Landing Gear The H-60's nonretracting main landing gear consists of two single axle, air/oil type of shock-strut assemblies that mount to the fuselage. Each is equipped with tubeless tires, hydraulic disc brakes, tie-down rings, drag braces, and safety switches. They are part of the lower end of the shock strut piston. Tail Landing Gear The H-60's tail landing gear is a nonretracting, dual wheel, 360-degree swiveling type. It is equipped with tubeless tires, tie-down ring, shimmy damper, tail-wheel lock, and an air/oil shock-strut, which serves as an aft touchdown point for the pilots to cushion the landing shock. MAIN ROTOR ASSEMBLY The main rotor (rotor wing) and rotor head (hub assembly) are identical in theory of flight but differ in engineering or design. They are covered here because their functions are closely related. The power plant, transmission, drive-train, hydraulic flight control, and rotor systems all work together. Neither has a function without the other. Rotary Wing The main rotor on the H-60 (fig. 4-17) has four identical wing blades. Other types of helicopters may 4-15 Anf0417 Figure 4-17.H-60 helicopter.